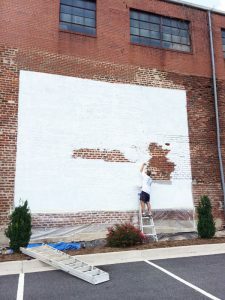 Kicking the "Warehouse Tryptic Mural Project" off right in Farmville, Virginia. 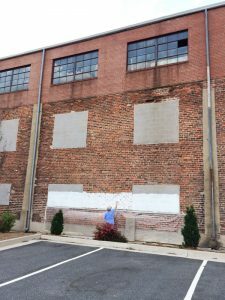 It was super cool to be able to start the “Warehouse Triptych Mural Project” on my Birthday with my parents here in Farmville, VA! Back in my home state working on a huge project with two of my best friends, A birthday that I will never forget spent creating! Color will start hitting the wall tomorrow! 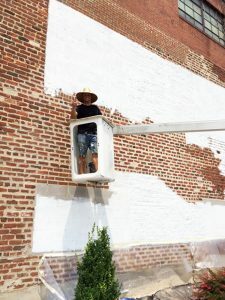 The 70′ x 20′ Triptych Mural will be completed over the next couple weeks. Thanks to everyone who cruised into Farmville to celebrate on my birthday and hang over the weekend! Great Memories!